When it comes to conservation, Costa Rica is small but mighty. Its success story stands as a testament to the idea that it’s never too late to reverse negative environmental impact: by the 1980s, Costa Rica had the highest deforestation rate in Latin America – a particularly dispiriting fact when you consider that Costa Rica also boasts the highest density of biodiversity on the planet. But today, 27% of Costa Rica’s land is protected by law, and the country is a world leader in conservation initiatives. How has Costa Rica become so successful? The simplest answer is reforestation. In 2010, the UN declared reforestation the easiest way to combat climate change, with countries across the world renewing – and growing – their investments in reforestation programs. In Costa Rica, nature reserves, ecolodges, and even country clubs are participating in reforestation efforts, and the results are promising. But reforestation is only the tip of the iceberg. In Costa Rica, promoting reforestation means pioneering connections in business, agriculture, and economics, plus one key industry that’s crucial for nature lovers making the pilgrimage to Costa Rica: ecotourism. When considering conservation, it’s easy to see the forest only for its trees. But trees provide habitats for an abundance of wildlife to live, eat, mate, and – most notably – move freely in. If a protected area is isolated from other protected areas, the species living there are limited to their immediate habitat, with little possibility to migrate for food. So, local environmentalists are turning their attention to foresting “biological corridors” to interconnect protected areas. But it’s more challenging than just planting trees. In many cases, potential corridors track along commercial land, with landowners often unwilling to sell. Yes, some are multinational corporations setting up coffee plantations, but frequently these are rural farmers who are not wealthy, and whose livelihoods depend on the financial profitability of their land. By the 1980s, most of Costa Rica’s deforestation had been the result of clearing land for agricultural use – raising cattle, selling lumber, and growing coffee, for example. But as the country turned toward reforesting, another shift emerged in parallel: the economy was leaning away from agriculture and toward tourism. Tourism as an industry presented its own environmental challenges: increased human traffic through Costa Rica’s natural areas, plus the resulting hotels, roads, and transportation that might or might not be environmentally sustainable. At the same time, tourism provided an opportunity for sustainable development. 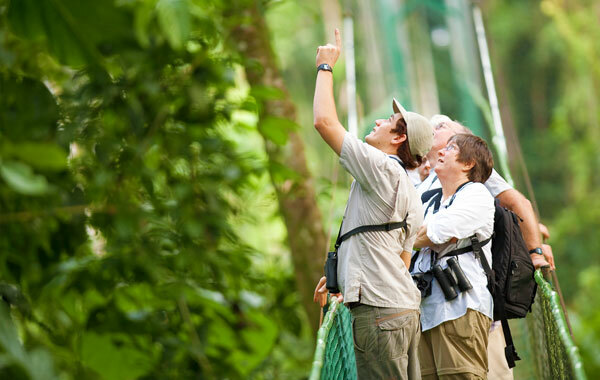 Because of Costa Rica’s rich biodiversity, nature-conscious travelers were already coming to the country, often for professional research or scientific study. Even hobby naturalists, like birders, were more likely to venture into remote natural areas to spot target species. Most of these “tourists” were already invested in preserving Costa Rica’s landscape, and willing to spend their money accordingly. With the growing market, eco-friendly accommodations were able to flourish and succeed. Selva Verde Lodge in particular embodies this narrative: in 1982, Giovanna Holbrook was traveling with a group of naturalists from the National Aviary when she encountered a 500-acre tract of land for sale. Facing the likelihood that it would be sold for logging or agriculture, Giovanna sprang into action and purchased the property to ensure its preservation for future generations. Selva Verde Lodge and Private Reserve was born, and continues today with the goal of bringing nature lovers into Costa Rica’s rich beauty while also contributing to its positive growth. As in the last 30 years, the collaboration of tourism and conservation pushes forward with continued growth in sustainable travel and community connection. Simply traveling to Costa Rica and spending money on eco-friendly products, in eco-friendly businesses and accommodations, supports the country’s push to financially incentivize green initiatives. If you want to get more hands-on, a simple internet search on nearly any region of Costa Rica will yield opportunities to get involved with local environmental programs – particularly reforestation. 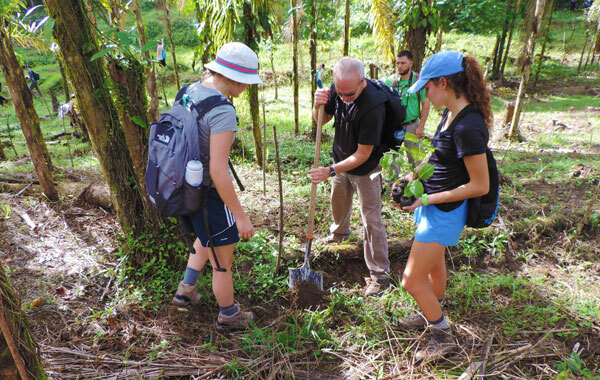 If you’re traveling to Selva Verde, you can connect with the Sarapiquí Conservation Learning Center and La Selva Biological Station to organize reforestation projects manned by travelers and community members alike. 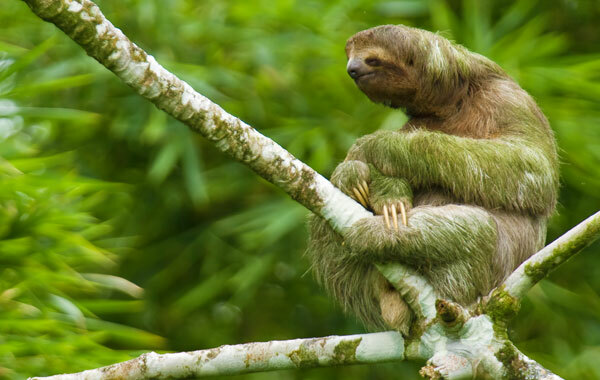 The Organization for Tropical Studies, the most productive scientific community in Central America, operates research stations at La Selva, Las Cruces, and Palo Verde, and all three sites offer a wealth of activities to educate and empower visitors about local conservation – plus living proof of the value of biological corridors. In the end, the story of Costa Rica’s drastic shift in conservation is embodied in the simple concept of reforestation: you plant seeds, and watch them grow. But it can be daunting to have faith in this idea, against the enormity of climate change. If you’re feeling weary about the state of our planet, remember this: during nature hikes at La Selva Biological Station, local guides make sure to point out that several lush, tree-dense areas were actually open pastures a mere 30 years prior. In a fraction of a lifetime, nature has proven that it’s up for the challenge – as long as humans provide support to match the pace.